Keep cool drinks cool! Cheers to this glassware for pulling double duty! 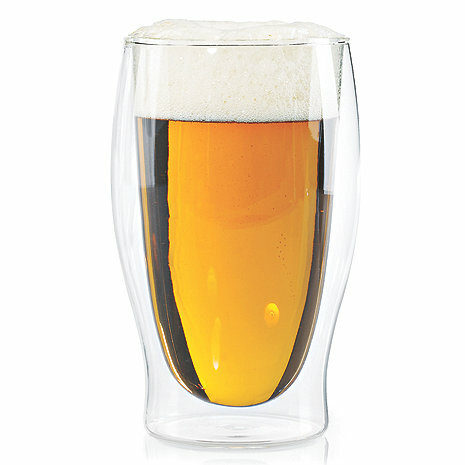 Its unique mouth-blown, double-wall design provides extra insulation, so your beer stays at its proper serving temperature regardless of how long you've held the glass. It also creates a "suspended" visual effect for a compelling presentation. Stable, durable design made of lead-free glass. Can you chill the Steady-Temp Double Wall Beer Glasses in the freezer? BEST ANSWER: These glasses seem to have been redone and they are not as heavy, thick or strong as before. Some batches simply cannot be put in the dishwasher, and they break readily elsewhere. Some are a bit stronger, but none are as good as those from - say - a year ago. I would try one glass in the freezer; it should be ok, but it may make it more fragile when you go to use it. I haven't done this as I haven't found the need, so my advice should be taken with a large grain of salt. Yes, the glasses can be chilled. Only problem I've had is using the ice dispenser with this glass. I tried filling it while empty and the ice broke the inner glass wall. I would only use this glass for beer, not mixed drinks. It is not recommended to put the glasses in the freezer as there is no liquid gel between the double walled glass. This glass i very fragile, so it would most likely crack due to pressure change. Not recomended! Never tried doing that so can not say if that is safe. Is the spigot leak-proof? Is the barrel already sealed or do you have to go through a process to seal it before putting your liquid in it? These are ready to enjoy, just pour and drink ! What spigot? This is a glass. They can be monogrammed by a third party as it is a service that is not currently offered online. BEST ANSWER: This product is actually made in the USA, out of the American White Oak Tree. It sure is! Thank you for your question. How long does the wine last in the barrel? BEST ANSWER: Thank you for you inquiry. Like any oak barrel, it is designed to house your beverage of choice for as long as it lasts! If you have any further questions, please feel free to reach out to us at 800 356 8466. Thank you again. Like any oak barrel, it's also designed to properly age your chosen beverage. So it would be up to you how long the wine would last. the Mini Oak Wine barrel is hand-made from American white oak." i wana check out. the top & botum of barrel- what kind of glu thay use. if its mix in wheat or whole wheat "what the name of glu? BEST ANSWER: No glue is used in making the barrels . BEST ANSWER: Thank you for your question, the Mini Oak Wine barrel is hand-made from American white oak. I want to buy this as a Christmas gift for my husband who loves to age his own tequila and whose previous barrels got too old. Is the "1 Liter Mini Oak Wine Barrel" suitable for that purpose? Unfortunately I never paid that close attention to the specs on the barrels he had been using previously. BEST ANSWER: Thank you for your question. You can use this as a vessel to age the tequila. Is the inside of this barrel charred? BEST ANSWER: Thank you for your interest in the mini oak barrel. They are toasted inside. Any other questions please call us at 800-356-8466. I Love these Glasses! They hold a 12oz. Beer perfectly (with room for head)! I'll never have to use frosted glasses again!! They keep your beverage nice and cold. Very good shape and design! Really nice glasses and they do keep the drink cool. But, these glasses are extremely fragile. You can barely tap them and they will shatter into a million pieces. My daughter had to have 4 stitches after bumping one on the shelf putting one away and it shattered. Great glasses, do not put in dishwasher! These are great glasses, they really do a great job in keeping my beer cold instead of drinking it from the can or bottle. HOWEVER, do not use them in the dishwasher as a couple started leaking. [...] I will hand wash from now on. [...]! These glasses are great for keeping your beer cold. I'm a slow drinker, and even when nursing a beer, the beer stays at the same cool temperature the entire time in this glass. Great for beer, keep colder longer - on a 12oz beer when finished almost as cold as when I started. Only problem I found is glass (due to the insulation design) is pretty big in diameter and hard to grasp if you have a medium to small hand (especially a woman's). Being 16oz. glass I would recommend to manufacturer to heighten glass to bring down the diameter size which it would make easier to grasp. Overall GREAT PRODUCT! It is VERY VERY fragile. Breaks or cracks easily. Great design, attractive to look at and keeps the suds chilly. It's delicate, so be careful. The glass is an odd shape and somewhat oversized. I've only had these glasses for a few weeks and already broke the inside of one with ice...if for beer use only, it would be OK.
Love these, but of late the new ones are far thinner, lighter and more fragile. Some couldn't survive the dishwasher. Wine Enthusiast is absolutely great at making things right, but I think I may need to look for a substitute. An excellent and attractive product for entertaining. Might be just a bit fragile for everyday use, but no more so than typical wine glasses. Keeps your beer cold even in the South Texas heat. We love these glasses and have some ourself and bought these for a Christmas gift. We get a lot of comments about them. They are great in the summer when it is warm outside. Really works, keeps beer cold and does not sweat. Be careful they are a little fragile. Great glass for cold or hot beverages. Requiers a somewhat large hand to use. I ordered these for Christmas, and everyone wanted more, so we re-ordered after Christmas. Love them. We love these glasses and the price was very reasonable. We use them by the pool as well and so far no cracks or chips and no fluid between the walls after washing in the dishwasher. They feel so light that it took me some time to convince my hubby that they weren't really fine plastic but really fine glass! Two of the glasses I ordered were broken when I received them. I returned the broken glasses but have not had a response. When you use a frozen glass, it's only good once. This glass can be used over and over as long as what you put in it is cold to begin with. Saves a lot of freezer space. The beer mugs are light and easy to hold. Plus they are dishwasher safe which makes it easy to clean. Your beer stays cold when you hold the mug since there is double glass. The glasses are delicate but you just need to be careful. As advertised. Holds 16 ounces and KEEPS your ale cold. We orginally bought only one set to try out. After several weeks the company was offering free shipping on glassware, so we purchased two more sets. These are great glasses! I bought these for my wife who has a constant glass of ice water set out in the kitchen since she drinks all day long. I could not stand the look of the ratty double walled glass she had been using. These are beautiful and keep the water cold -- no water rings. They are surprisingly sturdy; I had expected themn to be fragile. She loves them as much as I do. Shipping was very quick. One glass came in shattered and customer service sent a new one out to me immediately. Very professional and courteous. I use this for tea. I pour boiling water into it, then add a tea bag. Unlike other glasses, this has the great advantage that the glass does not get so hot that I burn my fingers when holding it. I actually bought these for my husband, but I've also used them with wine. I love how if you're holding the glass the contents don't get warm. A wonderful purchase for yourself and/or as a gift. There is no moisture on the outside of the glass. Very easy to grip/ handle. It should be a definite purchase. These glasses do an amazing job of keeping our cold drinks cold for a long time, with the added perk of no condensation. It does take a while getting used to the discrepancy in temperature between what our hands feel on the outside and what we taste of the liquid from the inside. It's a pleasant surprise every time! Surprisingly light, very comfortable and sleek. Does its job as described and looks good doing it. The glasses work great. The air space insulation keeps the drink colder longer than a cold glass. They look great, as opposed to the plastic variety. I use these glasses primarily for my own enjoyment but would not hesitate to use them for entertaining. They are nice looking, light and work like a charm. Not my first purchase. They keep drinks cold longer and don't sweat. But, they are delicate, so must be handled carefully. Living in San Diego California which is now the Micro Brewing Capital of all the US States. I can now enjoy the beer out side in the sun without my beer getting warm in a few minutes. As soon as the glasses arrived I poured a beer and left the glass in full sun for 15 minutes. The beer was as cold as when I first poured it..
Well made. Never sweats. Make a great gift. This keeps your beer cooool. The shape is not attractive nor is it easy to grip, but I bought it to keep the beer cool, and it does no that. I am happy with it overall. This could be difficult for small hands to hold. It is very light and might be too delicate for some. There is a pinhole seal at the bottom of the glass that opened on one of my glasses. Condensation developed on the inside of the vapor barrier. The other glass is still working fine. It is not only great for beer but could be used for an everyday glass. These glasses make having a beer truly special. The design keeps the beer cold and keeps you wondering how they made such a cool glass! Great glasses - nice look, keeps beverages very cold. My only complaint is that the glasses can take on water in dishwasher due to small pinhole in bottom of glass. keeps drinks cold! but very delicate, fell over on our counter top and shattered.